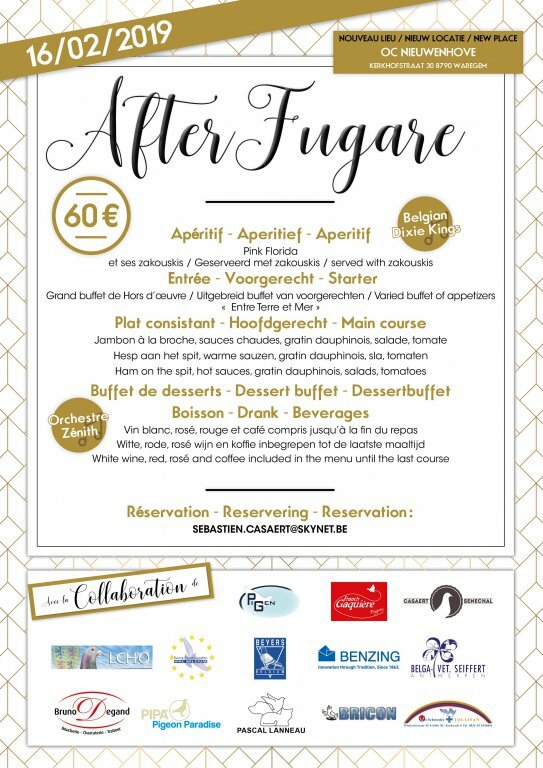 This year, the After Fugare will be heald on the saturday evening 16th of february 2019 around 19h in the room 'OC NIEUWENHOEVE' from Waregem. The organisators of After Fugare did their best to make of this evening another fantastic moment. During the start and until the early evening, the 'Belgian Dixie Kings' will do their best to create a super atmosphere. Then, they will be followed by the band 'Zenith' who will take care of ending the night in style. Sebastien Casaert and his team would also like to thank their sponsors. See you the saturday 16th of february 2019 at 19h in the 'OC NIEUWENHOEVE' localized at the Kerkhoefstraat in Waregem.